Seamless, flat-top design provides near universal-use compatibility: beverages, soup, medicine and more. Cup-hugging lip ensures secure attachment. Slightly raised rim enables stable stacking. Fits: 3.25-9 oz. Cups; Material(s): Plastic; Color(s): Clear; For Use With: 325PC, 400PC, 550PC, 325PCBLK, 400PCBLK, 550PCBLK. 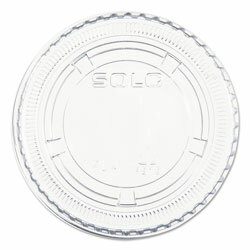 Cup Lids from Solo Inc.! 1304 In Stock today.